A day trader always needs to know the average range of the stocks/Index he is trading. By range we define as the distance ( High –Low) prices travel in a day. Large range days are conducive for trend following systems, Small range days are conducive for Mean reversion systems. There is one more called zero zone range, where the distance between high and low has shrinked to the point where placing trades itself is a problem as markets are not going to move beyond that, means price are going to stay in the same Entry spot for a long time. Not only that, getting good Risk reward scenarios are also very rare as the trades are done only thru limit order and scalps. Index especially the BankNifty Futures has been operating in a very low range in the recent weeks, making it very difficult to get Better Risk Rewards. Generally the Average high – low of Bank nifty is 400 points, now it has come to 150 to 200 point range average. When price movement shrink to the lowest we call as the Narrow range Day. This Narrow Range can have a look back period of 4 ,7 or 21 EOD. Today Bank Nifty had the lowest range of 112 pt approx , which is the lowest in the last 7 days. This is called NR7 pattern. This signifies a Big Breakout coming in the Index. you can see the Example below. The break might come as a BLAST. So If you catch it, ride it for a long time. As after heavy period of consolidation comes explosive breakouts and that will lead to daily range expansion. Historically Bank nifty have good ranges between Jan mid till November and Low range between December to January mid. Once this NR7 cracks open we will have large range days and good RR coming. 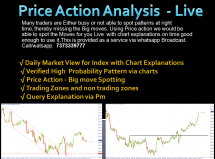 I teach traders to trade using price action in my one to one online price Action course , if you are interested you can call/watsapp at 7373339777 / 8508777733 for more details. We will discuss price action strategies to catch such moves.